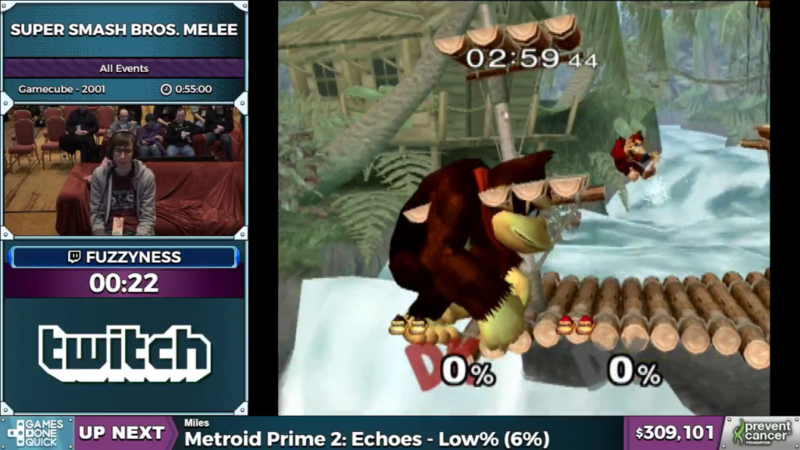 If you follow my work at NintendoStar, you’ll know that I’m a huge fan of Super Smash Brothers Melee. Although I’ve played all of the games in the franchise, Melee holds a special place in my heart. This is mainly due to the introduction of Event Mode, which tasks the player with defeating A.I. controlled opponents in specific scenarios. These range from little Mario fighting a giant Bowser, to a Triforce battle between Zelda, Link, and Ganondorf. They’re fun and exciting to play, and I’m sure they’ll be even more interesting to watch speed ran. 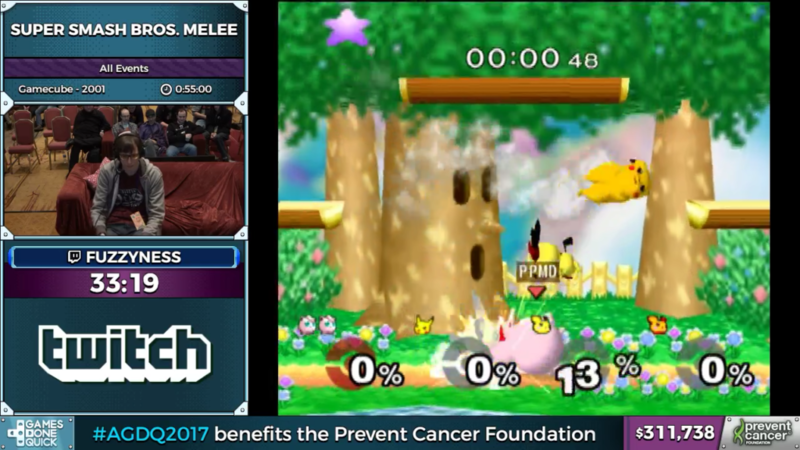 Let’s see how quickly our runner Fuzzyness can complete all of the events, as we continue our coverage of AGDQ 2017! Since Event Mode is broken down into several numbered events, I’ll list them off as Fuzzyness completes them. This way we can get a closer look at each individual event. However, quite a few events are solved the same way. The character Jigglypuff has a sleep attack that can kill an enemy in one hit if executed properly. I’ll skip these events to avoid repetition, unless something unique is done. The first event is a simple Mario vs Bowser fight. There’s not much to see here, as Fuzzy delivers early damage to Bowser. He forces him off the stage, and then quickly spikes him into the void. After repeating this again, it’s onto Event 2. This event has Fuzzy playing a huge Donkey Kong against a tiny Donkey Kong. While this event usually provides some annoyance due to how hard it is to land hits, Fuzzy finds an easy strategy. He immediately picks up the tiny enemy, and jumps towards the left side of the screen. Right before they both die, Fuzzy throws the tiny Donkey Kong into the side void. He repeats this and moves onto Event 3. Fuzzy chooses Jigglypuff for this event, as it’s the first event where the player gets to choose their character. 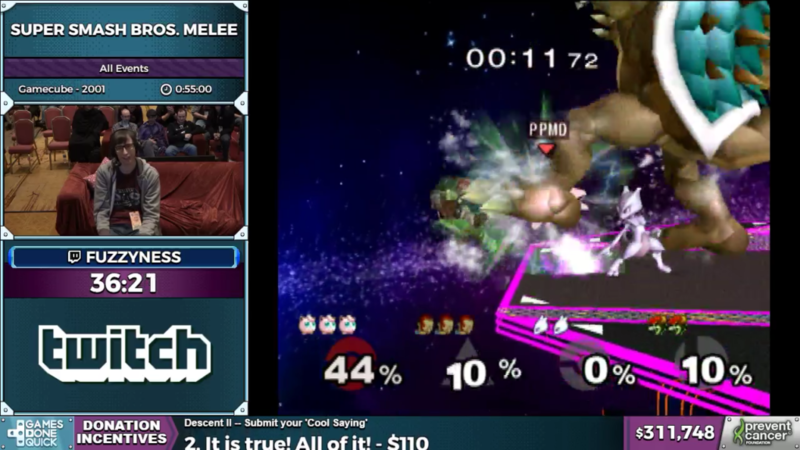 He is pitted against a Link and a Samus. Samus is quickly killed as Fuzzy executes a quick sleep attack, shooting her off into the void. This is an attack widely used by top competitive players, due to it’s high damage output. However, there’s a pretty big risk to using it, as missing the attack will leave you vulnerable for quite some time. Fuzzy repeats the sleep attack on Link, and clears the event. Switching over to Kirby, Fuzzy prepares for a battle against a giant Yoshi. After trolling him for a few seconds, Yoshi gets sucked up by Kirby. Fuzzy has 3 lives, whereas the enemy only has one. 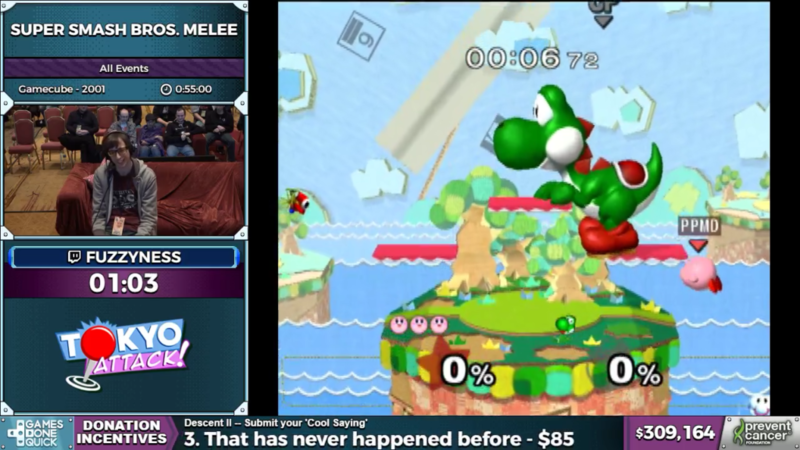 Due to this, Fuzzy jumps off the stage with Yoshi sucked up inside him, and completes the event. Spare Change is the first coin event, where dealing damage to the enemy nets you coins. 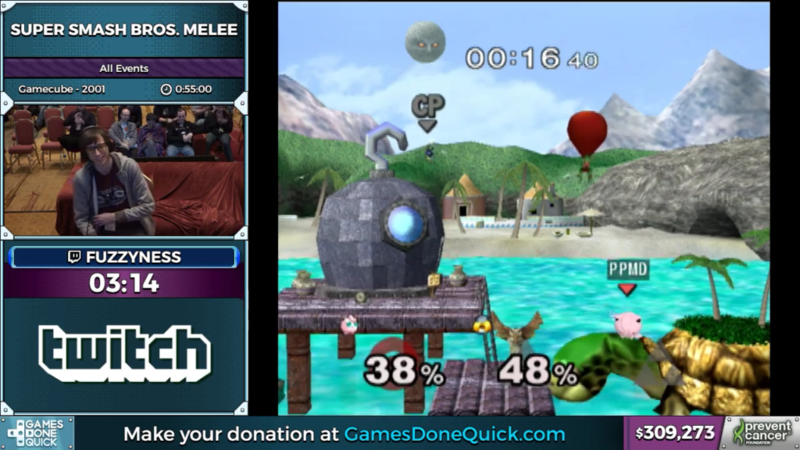 Using a precise set up, Fuzzy is able to smash Captain Falcon off screen, then lure him back. Then, he holds him in place as an environmental attack damages both of them, resulting in even more coins. After he collects 210, the event ends. Event 6 is pretty easy, with just a few low health Kirbys to fend against. Fuzzy chooses Fox, and makes quick work of the Kirbys using his Down + B move and a few smash attacks. Continuing with Fox, Fuzzy takes on a Pikachu in Event 7. By spamming Pikachu with laser attacks, Fuzzy is eventually able to break Pikachu’s shield and stun her. Picking up a Pokeball and praying for good luck, he chucks it at Pikachu. A Snorlax emerges, instantly killing Pikachu. Then, a Pokeball spawns in a perfect location. As soon as he throws it, Blastoise appears (the second best option to Snorlax). This immediately kills Pikachu, and Fuzzy flairs a bit and takes on Event 8. Using Captain Falcon, Fuzzy easily takes three stocks away from the Samus. By using a jumping knee, he one-hit kills each stock with ease. This event gives Fuzzy a tiny bit of trouble, as he is tasked with killing two Zeldas while they are in Sheik form. Using Jigglypuff, he attempts to execute the one-hit sleep attack kill. 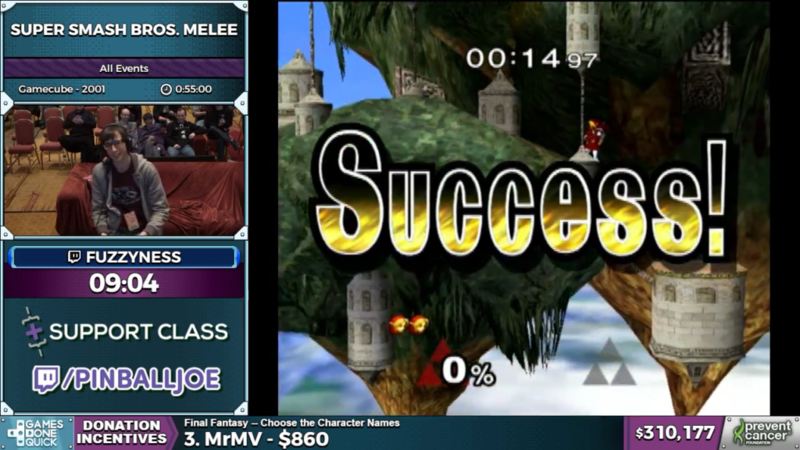 The first Sheik falls without a problem, but the second one gives Fuzzy a run for his money. After failing the sleep kill a few times, he finally manages to pull it off. All-Star matches are battles against key characters, one right after the other. The first set of five quickly get demolished as Fuzzy choose to go for the Jigglypuff sleep kill once again. He also utilizes small tricks like wave dashes to influence enemy movement. Keeping with Jigglypuff, Fuzzy moves onto the first automatically scrolling event. 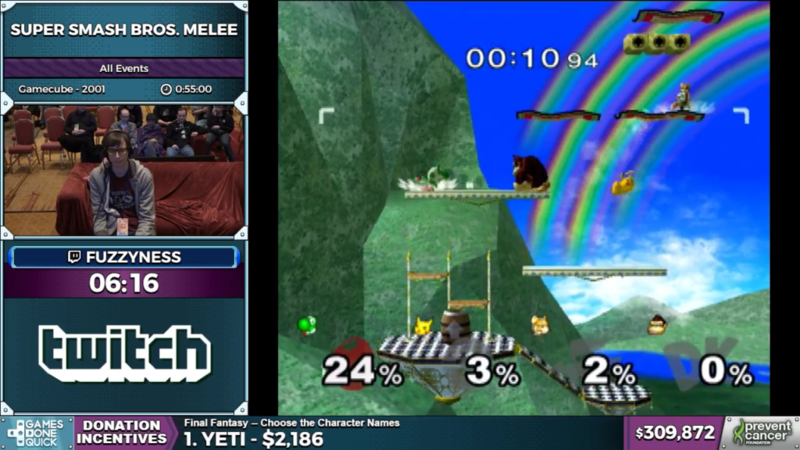 In a battle against the Ice Climbers, Fuzzy easily beats them up and down the screen. However, he simply has to wait out the clock to complete the event. It proves to be a small break in the otherwise super fast run. Much like Event 11, Event 13 is an auto scroller. Instead of battling, Fuzzy shows off some fun A.I. manipulation. Trophy battles are against randomized characters, but nothing can stop the brutal pull of Jigglypuff’s sleep attack. Fuzzy makes quick work of Kirby, Daisy, and Fox. Event 15 gives Fuzzy his real first annoyance of the run. Using Jigglypuff, he misses a double sleep kill at the beginning of the fight. After missing quite a few more, Fuzzy gets his mojo back and pulls off a few double kills. This event features a bunch of Kirbys walking along Star Fox’s ship. By adjusting his movement and waiting for the perfect timing, Fuzzy is able to take out multiples at once with the Kirby Star powerup. He repeats this a few times making quick work of the fluffy yellow Kirbys. This event gets easily cleared as Fuzzy spikes Bowser downward as soon as the fight starts, resulting in his immediate watery death. 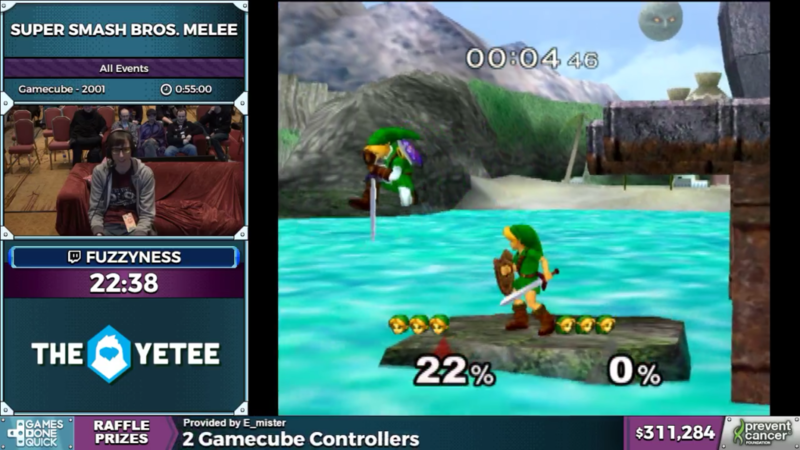 One of my favorite events, Link’s Adventure pits Link up against Shadow Link. However, Fuzzy makes quick work of Shadow Link by sitting in the bottom right platform and baiting him in. With a quick slash of his sword, Shadow Link plummets to his first death. After baiting Shadow Link back to the spot again, Fuzzy is able to manipulate the A.I. into performing a risky attack that causes it’s own death. This event has you protecting Peach against Bowser. By chaining together grabs, Fuzzy is able to keep Bowser from damaging Peach too much. Ice Breaker tasks the player with separating two pairs of the Ice Climbers. By using Fox’s Down + B “shine” attack, Fuzzy quickly isolates and voids out the two icy opponents. Event 22 is a battle against 128 Marios. However, these Marios have very low life and can be killed with just one hit. 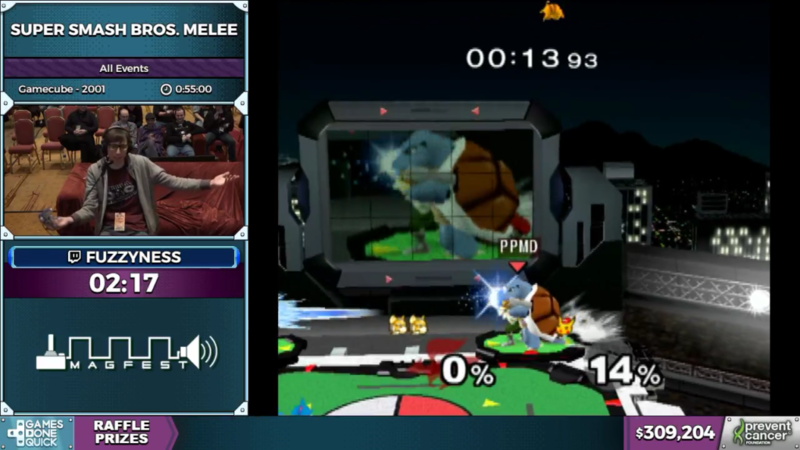 Using Pikachu, Fuzzy sets up a pattern that allows him to quickly kill off a handful of Marios a second. A floating carpet and a Birdo almost throw a wrench in his strategy, but he cleans up just fine. He does so well in fact, that he secures a new Personal Best Time on the event! Event 23 provides a tiny bit of annoyance for Fuzzy, as he is tasked with fighting a bunch of Yoshis. Using Pikachu, he falls into a rhythm similar to Event 22, but drops it mid-way. Fuzzy reverts to a back up pattern, and is able to clean up the egg layers with ease. This event features a giant Donkey Kong versus a giant Bowser. By grabbing the edge and canceling the animation at the last second, Fuzzy is able to trick the enemy Donkey Kong into falling off the edge. It’s the battle of the Samuses! This event pits you against three metal Samuses, which can take high amounts of damage before flying off the screen. Fuzzy hugs the left edge and smash attacks as hard as he can, causing the enemies to fly off the edge. He then manipulates their movement, causing the enemies to fail their attempt to re-land on the platform. Much like the Yoshi Herd, Puffballs is all about multiple Kirbys. Using Doctor Mario, Fuzzy is able to uppercut most of them as they spawn, immediately shooting them into the upper void of the stage. This continues like clockwork, as he moves underneath groups of Kirbys and ejects them into space. Another favorite event of mine, Triforce Gathering puts Link and Zelda against Ganondorf. Fuzzy attempts a trick similar to the one he did on Shadow Link, but fails. This forces him to play out the event normally, losing some valuable time along the way. Event 33 is our first non-combat event, tasking Fuzzy with a literal speedy run. Using Captain Falcon, Fuzzy must dodge super fast race cars on the F-Zero stage. With a few quick jumps, he clears the event with style. Event 34 is a battle across time. Fuzzy plays as Young Link in a fight against Adult Link. 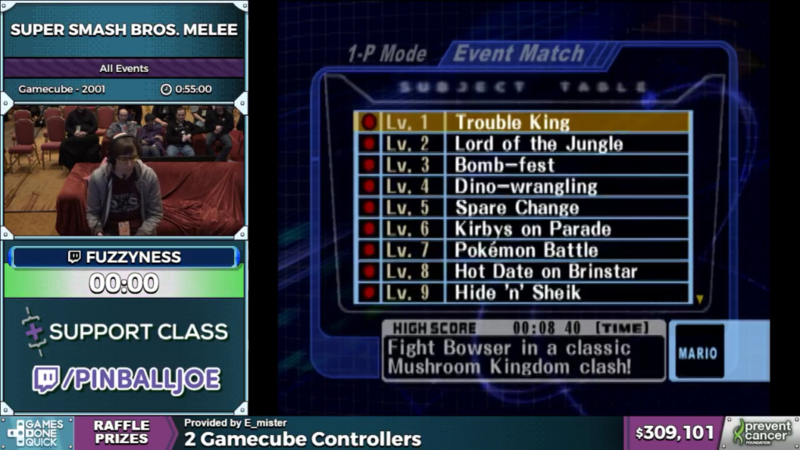 However, he is able to cut the battle short by using a precise set up in the bottom left corner. By slashing three times with his sword attack, Fuzzy is able to bait a down-smash from Adult Link. Then, by dodging at the right time, he evades the attack and sends Adult Link flying into the void. He repeats this a few times and moves on. Event 43 takes place in F-Zero again, and pits Fox up against Falco and Captain Falcon. Instead of fighting on the main ship, Fuzzy drops down the cars below, baits Captain Falcon, and then throws him into the street. However, Falco causes Fuzzy some stress by wandering off and interrupting his pattern with a Pokeball. He loses quite a bit of time dealing with Falco, but eventually defeats him. 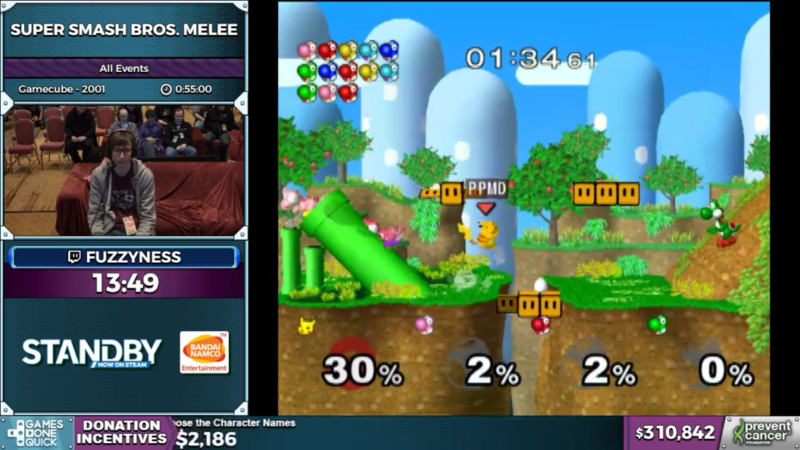 Instead of choosing his standard Jigglypuff for Event 46, Fuzzy opts for Fox. By baiting the enemy Roy at the correct time, Fuzzy is able to set up a pattern that allows him to throw enemies directly into the void. This works for a few lives against both Marth and Roy, but Roy causes him some trouble after a few deaths. Fuzzy laughs this off and sends him flying into the side of the screen, and taunts Marth as he falls to his death as well. Event 48 is usually where Fuzzy starts all his runs, and it’s so he can practice a very specific trick to get a double sleep kill. The rest of the event falls to more sleep attacks. It’s time for the boss battles, and what better place to start than Final Destination? Fuzzy opts for Ganondorf in his fight against the Master Hands. Thanks to Ganondorf’s high damage attacks, and the boss’ lack of crazy movement, Fuzzy is able to quickly put them in a coffin. It all comes down to this, the final showdown. 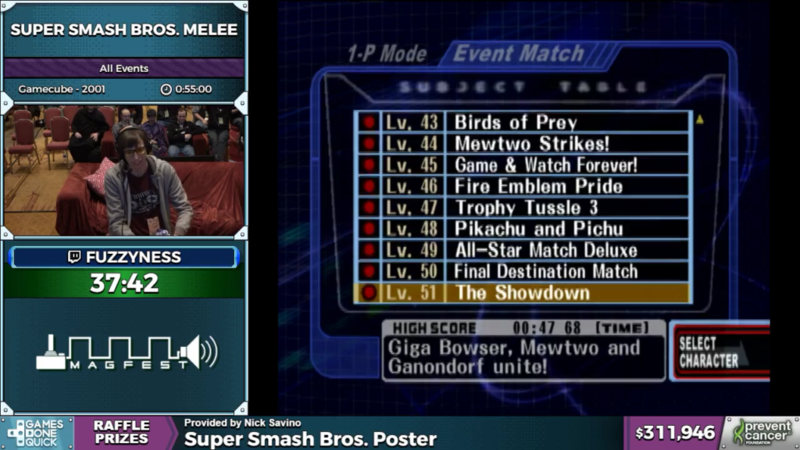 A battle against Mewtwo, Ganondorf, and Giga Bowser. 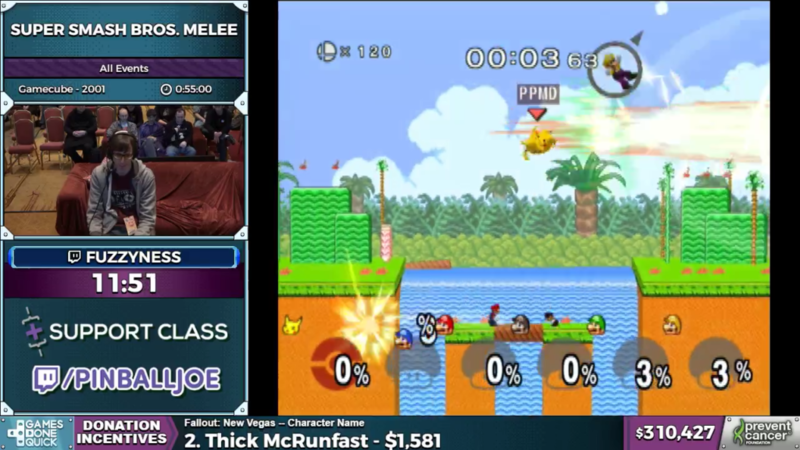 However, if there’s anything this run as taught us, it’s that nothing can match Fuzzy’s Jigglypuff. After scraping Giga Bowser off his boot and slopping him off to the side with Mewtwo, only Ganondorf stands in the way of completion. Ganondorf manages to dodge around Fuzzy quite a bit though, causing him to lose some time towards the end. With one last sleep attack, Fuzzy finishes Event 51 and the run.